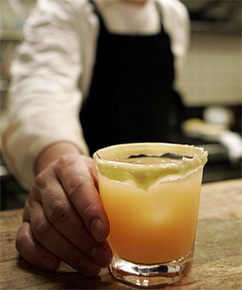 When Koji Nakamura mixes up a margarita cocktail, he adds a special ingredient - mayonnaise. "Mayogarita", a white drink with a hint of the creamy dressing, is one of several cocktails Nakamura serves in his "Mayonnaise Kitchen" restaurant in suburban Tokyo, which features mayonnaise on everything from toast and spaghetti to fondue. Despite its Western heritage, mayonnaise has become the condiment of choice for many young Japanese, who add it to everything from sushi, noodles and tempura. While older Japanese might gag at the thought of mayonnaise on rice or savory pancakes, the young are slathering it on. They even have a name for mayo fanatics: "mayolers". "People keep discovering various ways to cook food with mayonnaise," Nakamura said. In 2006, Japanese consumed 1.65 kg of mayonnaise per person, down from a peak of 1.90 kg in 2000, according to the Japan Mayonnaise and Dressing Makers' Association. Nakamura's tiny restaurant, with fewer than a dozen tables and decorated with cut-outs shaped like mayonnaise bottles, also offers "Mayoty Dog", which tastes like the vodka-based cocktail Salty Dog but is served in a glass with mayonnaise on its rim instead of salt. Patrons of the seven-year-old restaurant can buy their own bottle of mayonnaise for 300 yen ($2.53) - similar to bars that keep regular customers' bottles of whisky or sake. "I know it's rich, but I like the taste," said 22-year-old Mayumi Kameoka. "My friends and I used to put a lot of mayonnaise on bite-sized fried chicken at our school cafeteria." Japanese mayonnaise, first produced in 1925, is creamier and tangier than its Western counterpart, and includes only egg yolks, not whites, with varying amounts of oil and vinegar to alter the taste. Manufacturers provide a constant stream of recipes that involve the dressing, helping to make it a staple in most Japanese refrigerators. "It has a good flavor," said Akira Omori, 32, who likes to put mayonnaise on dried squid and other snacks. Health-conscious Japanese are, however, starting to eat less of the dressing, prompting manufacturers to introduce low-calorie versions, including one that says it reduces cholesterol levels. Mayonnaise lovers also got some bad news when No.1 Japanese mayonnaise maker QP Corp's lifted prices in June for the first time in 17 years due to higher vegetable oil prices. Right now, though, Nakamura of "Mayonnaise Kitchen" is more worried about a summer heat wave seems to be dampening customers' appetites than the future. "I see people going into a soba noodle shop downstairs. I can understand that," he said.